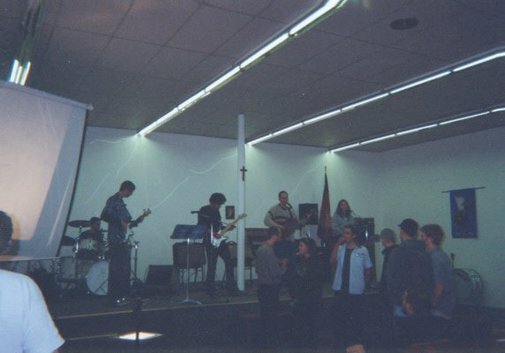 Some of the local musicians from the first meetings at the Salvation Army Building in Fort St. John. You learn skills and develop a value system based on childhood experiences. I was very close to my grandmother when I was young. She and dad both encouraged me in my Native Heritage as she had Mohawk blood. She would often visit and in the summers I would travel with mom and dad to her house. After nana had a stroke I would visit her in the hospital and hold her hand. I learned how to comfort her and could feel her love for me even though she couldn't talk. When I was only 13 I was told that I would help hurting people when I grew up because I cared about people. I had no idea what that was going to look like as I pursued my interest in heavy equipment and road building. After working in logging, road building and mining I decided to attend college and learn about helping at risk youth. After my first year I returned to the work force in the oilfields north of Fort St. John. For just one year was my plan. After a long winter in camp, spring came and I ended up in Fort St. John talking to a social worker at the Salvation Army about the needs of the youth in this city. This social worker told me that 3 teenagers had just committed suicide in the previous month and that in the last year every two months another teen takes their own life. This just broke my heart. I could think of little else after that so I began Revival Fire Youth Meetings in Fort St. John to try to make a difference. 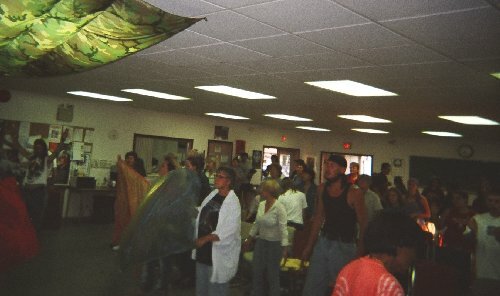 Northernfire hosted this Fresh Fire conference at the Native Friendship Center in 2004. The first meetings were held at the Salvation Army and this was a weekly Saturday night meeting. A safe place for young and old to hang out. We also had teams go out, we handed out sandwiches and hot coffee on the street and we welcomed the street people into the meetings. We averaged 40 to 50 people a night. Many years later I still get encouraging feedback from people who were encouraged by these meetings. This first stage of ministry for at risk youth lasted almost a year then I led the youth out at Rose Prairie before moving to the Native Friendship Center. When the city meetings started up again at the Native Friendship Center, I rented the center every Saturday and moved in my drums, guitars and sound system. This work started as a youth group for at risk youth and grew into being a street outreach. I learned how to grow a work that was reaching out to street youth and adults. It was an independent work, a street mission essentially, self financed from my oilfield work. We had free pizza and pop every Saturday to bring in the needy and hurting and hungry. The music was edgy, loud and driven by electric guitars, bass and pounding drums. It wasn't a place for regular city youth but for the hurting youth and adults of the city. Back then there were homeless youth camping in parks and in wooded areas on the edge of town. They are hidden outcasts from society. Who knows their pain and their stories? The street people had a lot of issues and rough edges but we learned to accept and love them. I'm so proud of the Rose Prairie youth that helped out in this work. The Native Friendship Centre youth joined with us and as I trained up youth on drums and guitars, music became a great attraction for the young people. Some nights there were three different live bands along with the free pizza and pop. I started doing this kind of work in Fort St. John because of the teen suicide issue and essentially that was the core value of this work, teen crisis intervention. We had occasions where individuals would come to us very despondent and by talking and counselling with them, we saw lives delivered from death. Sometimes medical science is the only answer but sometimes it's not enough. We saw things that couldn't be explained by modern science and could only be called miracles. One of my regular kids was from a very painful home situation. I taught him how to play drums and guitar. He just loved music and he had such a soft heart. One night he was late getting home and his mom got upset and went out looking for him. When she went to the skateboard park at eleven o'clock at night a group of intoxicated youth swarmed her car and really scared her. She came home traumatized to find her son had gotten home already. There were strong emotions and my young friend felt so bad that he blamed himself for his mom's unfortunate experience and her reaction to it. He felt like he just couldn't live with himself anymore. He just couldn't live with himself anymore. His mom called me at 2:30 am. from emergency. Could I please come into town and pick up grandma from the seniors apartments and bring her to the hospital? She needed to say goodbye to my young friend as he was dying. He had drank a bottle of Drano. I came into town as quick as I could and brought grandma to the hospital. It didn't look good. The doctors said there was nothing that could be done and that it was a painful way for the young man to die. He was hooked up to machines and had tubes going into him and had an oxygen mask on. His skin was a funny red colour and he could talk but not very well. People just started to pray. Then he said it didn't hurt as much and something had changed. It must have been a miracle as in the morning the doctors put a scope into his stomach and they could not find anything wrong at all! They were baffled according to his mother. The following night he ate a full roast beef dinner that I brought for him. Then the doctors released him. He is a survivor. Then there was a boy named N. His grandfather introduced him to me when he was 11 years old. Grandfather was concerned for him as there was such a history of substance abuse in the family and he was afraid young N. would fall into this pattern. I began to teach N. how to play drums and then guitar. He had such anger issues and I guess it is understandable. His mom worked the streets at night in a certain city and so he had lived with his grandma who was a crack user. One day mom came to visit. So mom and grandma shot up with crack in the living room. Grandma overdosed and died. Young N. told me how devastating this was for him as a 5 year old! When he was 7 he didn't want to live any longer and tried to end his life by jumping out of a tree onto boards with nails in them. There is so much pain for some of these young people. He is a survivor. Then there was a young girl who came to one of the Saturday night meetings. I was in the middle of a song when she walked up in front of me. When I finished the song she pulled up her sleeves to reveal fresh, bloody, lacerations on her arms. She showed me the knife she had with her and handed me a note revealing the pain in her heart. I put my guitar down and talked with her. I had others help me as well and we spent the rest of the evening while the meeting continued, listening to this girl and letting her tell her story and getting the pain out. Listening is so important. She is a survivor. What I noticed with these children and teens over the years was that even though they lived through some truly horrid experiences, with caring intervention they could get through the hard times. Music especially is helpful. Sadly, often their own homes were not safe places, their parent or parents having their own substance abuse problems. Everybody has pain, it is part of life and yet some people have resilience and others do not. There are so many ways people try to medicate their hurt. Not facing the pain, being stuck in negative behaviours and then affecting everyone around them. It is the children that suffer the most in a town like this. I continued in this work for 6 years and then it was another change of seasons as I was going to a remote camp job for work. The youth I had been working with were now young adults and were going away for work and some even to college. They had survived some tough times as teens but now they were more resilient young adults with skills and the capacity to weather the storms of life. Some of the Streetfire youth.